Listen on iTunes while using GoldMine! Marketing is often presented with a dizzying array of metrics many of which are useless. 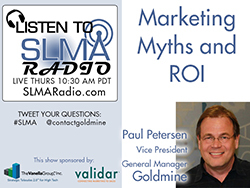 In this SLMA Program, Paul Petersen, GM and Vice President of GoldMine discusses how some of the most common metrics may not be what you think and in fact may be marketing myths. 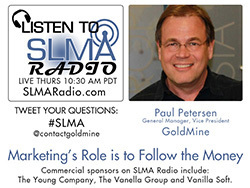 Petersen has been on some of the SLMA’s most listened to programs including: Follow the money - that’s marketing’s role, CRM’s shouldn’t be the leaders in technology and Why CRM is NOT a settled science! The host this week is Jim Obermayer. Marketing departments spend from a few percent of yearly sales to 20% or more. If marketing managers can't follow the money they aren't doing their job. 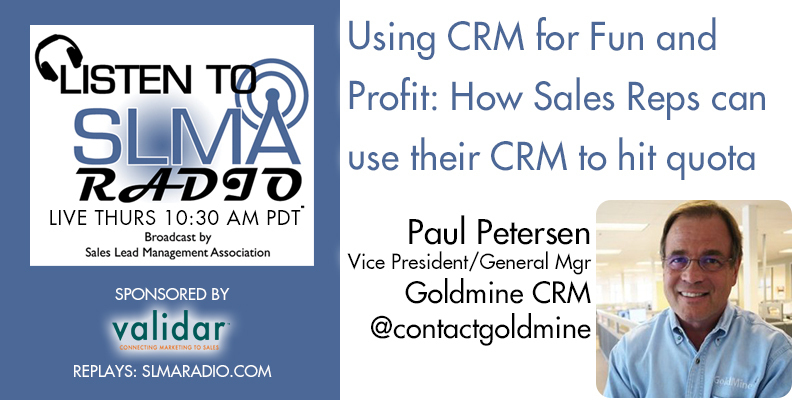 In our program this week with Paul Petersen, GM and Vice President of GoldMine Software we discuss ways that marketing management can make better decisions in lead generation and lead management by following the money. This program is live, not scripted and the host is Jim Obermayer. 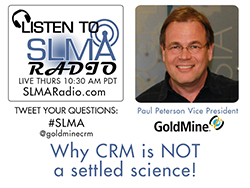 Mr. Petersen was a guest on SLMA Radio when he addressed the subject: Why CRM is NOT a settled science! It is one of the most listened to programs so far in 2015. Mr. Petersen is the general manager and vice president of the GoldMine business unit of HeatSoftware Inc. His career spans working with sales & marketing systems and process having developed, managed, and sold for companies including McDonald's Corp, General Electric , Symantec, Allied Van Lines and now has 16 years with CRM background at GoldMine. Mr. Petersen holds a JD from Loyola University of Chicago and was one of the first to be awarded the Professional Certified Marketer designation by the American Marketing Association.